Current lands of Japan and the neighboring countries (greenish area with black contour).Presumed past land boundaries are indicated by brown-white area (white denotes 120–140 m) when sea levels decreased by 140 m during the last glacial maximum estimated from a bathymetric map (A). Top right and bottom right panels are magnified maps around the Tsugaru Strait (B) and Tsushima Strait (C), respectively, which are about the threshold levels for the existence of land bridges. Mentions: The Japanese archipelago exhibits a high endemism in fauna and flora in which speciation has occurred in isolation after colonization from the eastern Eurasian mainland –. Because of the lack of freshwater fishes and considerable topological changes due to volcanic activities, past environments of Japanese archipelago and the colonization patterns of animals and plants are less well-known compared to Europe and North America. 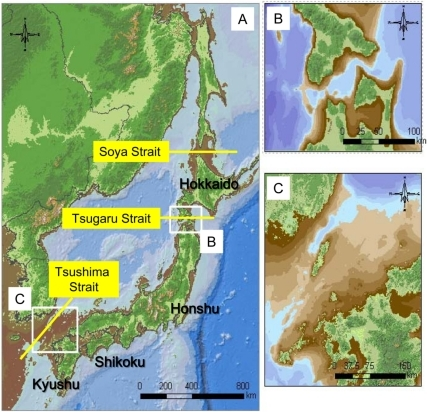 Land bridges are particularly important for understanding the mode and pace of species divergence in Japan; the Tsushima Strait (130–140 m in depth), Tsugaru Strait (130–140 m in depth) and Soya Strait (50–60 m) would have been land bridges during lower sea levels and the main colonization routes to the archipelago (Figure 1). Fauna and flora in Honshu, Kyushu and Shikoku islands have probably been colonized via the Korean Peninsula through the Tsushima Strait, whereas those in Hokkaido arrived from Sakhalin Island through the Soya Strait –. The Tsugaru Strait has acted as a significant barrier, creating the two Japanese bioregions (i.e. Hokkaido and the other main islands). "Over the native range, most populations consisted of unique 16S mtDNA haplotypes, resulting in significant genetic divergence (overall F(ST) = 0.96).This study provides one of the best examples of how phylogeographic analysis can unravel a detailed evolutionary history of a species and how this history contributes to the understanding of the past environment in the region.Ongoing local extinctions of the crayfish lead not only to loss of biodiversity but also to the loss of a significant information regarding past geological and climatic events." "Intra-specific genetic diversity is important not only because it influences population persistence and evolutionary potential, but also because it contains past geological, climatic and environmental information. In this paper, we show unusually clear genetic structure of the endangered Japanese crayfish that, as a sedentary species, provides many insights into lesser-known past environments in northern Japan. Over the native range, most populations consisted of unique 16S mtDNA haplotypes, resulting in significant genetic divergence (overall F(ST) = 0.96). Owing to the simple and clear structure, a new graphic approach unraveled a detailed evolutionary history; regional crayfish populations were comprised of two distinct lineages that had experienced contrasting demographic processes (i.e. rapid expansion vs. slow stepwise range expansion) following differential drainage topologies and past climate events. Nuclear DNA sequences also showed deep separation between the lineages. Current ocean barriers to dispersal did not significantly affect the genetic structure of the freshwater crayfish, indicating the formation of relatively recent land bridges. This study provides one of the best examples of how phylogeographic analysis can unravel a detailed evolutionary history of a species and how this history contributes to the understanding of the past environment in the region. Ongoing local extinctions of the crayfish lead not only to loss of biodiversity but also to the loss of a significant information regarding past geological and climatic events." "Land bridges are particularly important for understanding the mode and pace of species divergence in Japan; the Tsushima Strait (130–140 m in depth), Tsugaru Strait (130–140 m in depth) and Soya Strait (50–60 m) would have been land bridges during lower sea levels and the main colonization routes to the archipelago (Figure 1)." Including humans. Others have pooh-poohed the idea that humans could have walked to Japan whenever I have mentioned the prossibility. Now we can be reasonably sure of it. What is especially interesting here is that there are three straits connecting Japan to the mainland. The Soya Strait, currently at only 65m depth, would have been a landbridge connecting the island of Hokkaido to the Sakhalin Islands at about 65,000 BP, then again at 55,000 BP, then continuously from about 50,000 BP to about 8,000 BP. The Tsushima Strait, at about 130-140m depth, connecting Southern Japan with South Korea, would have only been open briefly during the LGM about 20,000BP. Similarly, the Tsugaru Straight would have only briefly connected Hokkaido to the Main Island of Japan by a narrow isthmus, about 20,000BP. So you would expect to see a connection of Hokkaido with the Sakhalin islands. The ancient DNA paper I posted tonight on the Hokkaido Jomon does in fact indicate continuity with Beringia. While it is not certain that the connection is by way of Sakhalin, it would seem the most probable path. If you've had a close look at the recent Thalmann dog domestication paper, you will also note a Japanese wolf that is an isolate. Interestingly enough, in the diagram, its closest relatives are ancient DNA wolves from Alaska. "So you would expect to see a connection of Hokkaido with the Sakhalin islands". "The Ainu (Japanese: アイヌ? ), also called Aynu, Aino (アイノ), and in historical texts Ezo (蝦夷), are an indigenous people in Japan (Hokkaidō) and Russia (Sakhalin and the Kuril Islands)". "The Nivkh (also Nivkhs, Nivkhi, or Gilyak; ethnonym: Nivxi; language, нивхгу - Nivxgu) are an indigenous ethnic group inhabiting the northern half of Sakhalin Island and the region of the Amur River estuary in Russia's Khabarovsk Krai". "Of the 14 shared types, the most frequently shared type was found in common among the Ainu, Nivkhi in northern Sakhalin, and Koryaks in the Kamchatka Peninsula". I haven't looked at your new posts yet. Thanks for the links for the Ainu, Nivkhs and Koryaks. Yes, there does appear to be a lot of evidence from multiple sources that the Nivkh and Ainu have some common history.